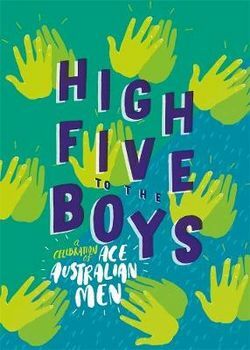 Seventeen men and women on the Random House publishing team volunteered to write the biographies of dozens of Australian men who are featured in this book which follows Shout out to the Girls published earlier this year. All the men depicted – some Anglo, some Aboriginal and some from migrant backgrounds, some deceased, most still living – are honoured for the contribution they have made to our society. Fifty men, all prominent in their respective fields, are listed in the contents. Many, such as John Curtain, Michael Kirby, Weary Dunlop and Steve Irwin, are household names but others – Eddie Ayres, Troye Sivan, Briggs and Elvis Abrahanowicz to mention just a few – are lesser known. Each of the book’s sections offers a high five (defined in the book as ‘a public salutation to express gratitude or solidarity’) – to sportsmen, politicians, activists, engineers and philanthropists, and more. One man who intrigues and who deserves a high five is David Walsh (1961-) whose winnings at a casino made him a millionaire; Walsh used his wealth to founded MONA, The Museum of Old and New Art, which has since become one of his home state’s foremost tourist attractions. Another man is Taj Pabari who has educated more than 100,000 children in how computer tablets work and how easy they are to build. Jordan Nguyen has invented a wheelchair which works by mind-control. There are so many fascinating stories in his book! Accompanying the story of each of the mean's achievement are coloured portraits by numerous illustrators employed in the book such as Andrew Joyner, Andrew Weldon, Tohby Riddle and Tom Jellett. Most of the illustrations are cartoons but some, such as that of Harley Windsor (figure skater), John Curtin (politician) and Paul De Gelder (Navy diver) are realistic. There are many stories like Walsh’s which give a background to the man’s achievements. Other positive role models depicted in High Five to the Boys are businessman and philanthropist Mei Quong Tart, biomedical engineer Jordan Nguyen, activist and mental health advocate Jason Ball and comedian and environmental campaigner, Craig Reucassell. This list only scrapes the barrel of many fascinating short biographies which are sure to be read avidly by boys and young men interested in not only amazing Australians, but the occupations they are engaged in, such as fashion designing, architect, justice -- and more. The book is designed in-house by Astred Hicks who has used bright pink fly pages and strong, bright coloured pages to introduce each man. Certainly, the book which has highlighted many lives and was created by many, is sure to find a welcome spot in school and home librarians. Full marks to Random House which is donating all royalties from the sale of the book to The Smith Family.